Brothers Nathan and Bub Bright meet for the first time in months at the remote fence line separating their cattle ranches in the lonely outback. Their third brother, Cameron, lies dead at their feet. In an isolated belt of Australia, their homes a three-hour drive apart, the brothers were one another’s nearest neighbors. Cameron was the middle child, the one who ran the family homestead. But something made him head out alone under the unrelenting sun. Nathan, Bub and Nathan’s son return to Cameron’s ranch and to those left behind by his passing: his wife, his daughters, and his mother, as well as their long-time employee and two recently hired seasonal workers. While they grieve Cameron’s loss, suspicion starts to take hold, and Nathan is forced to examine secrets the family would rather leave in the past. Because if someone forced Cameron to his death, the isolation of the outback leaves few suspects. 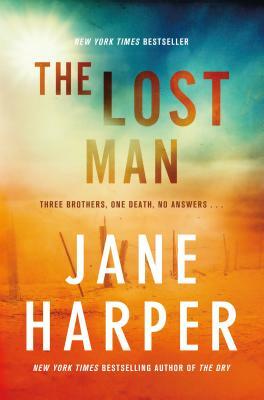 A powerful and brutal story of suspense set against a formidable landscape, The Lost Man confirms Jane Harper, author of The Dry and Force of Nature, is one of the best new voices in writing today. Jane Harper is the author of The Dry. Winner of the Victorian Premier’s Literary Award for an Unpublished Manuscript,The Dry is Jane’s first novel, with rights sold to over twenty territories. Jane worked as a print journalist for thirteen years both in Australia and the UK and lives in Melbourne. "Harper's masterful narrative places readers right in the middle of a desolate landscape that's almost as alien as the moon's surface, where the effects of long-term isolation are always a concern. The mystery of Cam's death is at the dark heart of an unfolding family drama that will leave readers reeling, and the final reveal is a heartbreaker. A twisty slow burner by an author at the top of her game." "The atmosphere is so thick you can taste the red-clay dust, and the folklore surrounding the mysterious stockman adds an additional edge to an already dark and intense narrative. The truth is revealed in a surprising ending that reveals how far someone will go to preserve a life worth living in a place at once loathed and loved." "The novel shimmers with the heat of the Australian outback. I was mesmerized by this extraordinary vast brutal place and Harper's minutely observed, subtle and nuanced story within it."